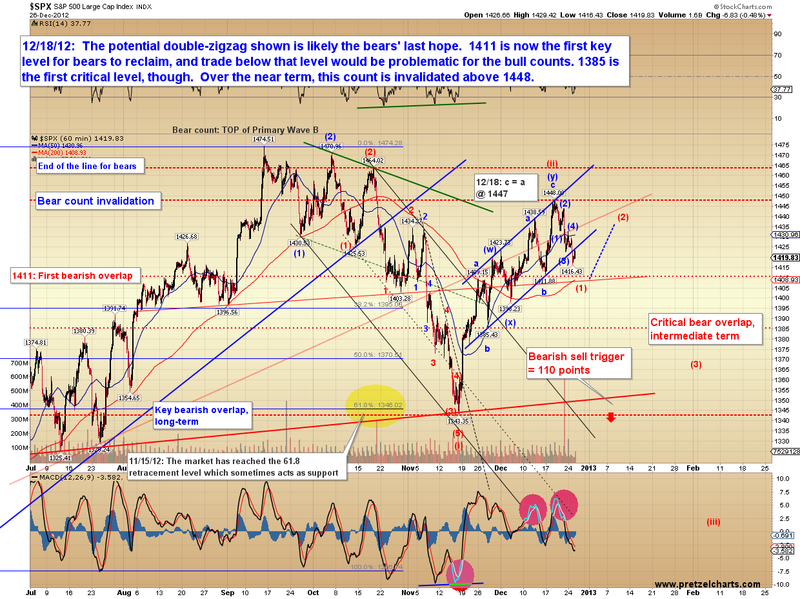 Last update noted that the market had reached an important inflection point, and that remains true today. It's interesting how the market has aligned itself to react to the news over the next few sessions. Obama cut short his Christmas in Hawai'i (where I reside) to fly back to Washington in order to discuss the "Fiscal Cliff" and how to avert falling off it. The market seems to be keyed into those talks. Meanwhile, I keep thinking of a scene from the movie Margin Call, in which Paul Bettany is standing atop the ledge of a skyscraper and says, "The fear most people feel when they stand on the edge like this is not actually a fear that they will fall. Instead it's the subconscious fear that they might jump." One sometimes wonders which it is for our leaders: the desire to avoid falling... or the other. In keeping with this theme, bears have taken the S&P 500 (SPX) right to the edge of its own cliff, and it's now teetering near the important support zone of 1411. After the November bottom, the market suggested a "safe" target zone of 1445-1455 which it reached -- but since then, the market has kept its options open. There is no clear answer just yet as to what its intentions are, but it is worth noting that it found a top within 1 SPX point of my bear count's expectations, then reversed solidly Accordingly, objectively, I'm forced to give the bearish count equal weight for the time being. Elliott Wave analysis is fractal-based, so when we work with it as a predictive tool, we're often attempting to anticipate the fractal that's being formed, in order to know where it leads. Some fractals are quite clear and "high probability" interpretations. Others are vague and need clarification through the market's next move. This is one that could still go either way. Below is the bearish interpretation of the fractal, and some keys to watch which will aid in clarifying what this pattern "is or isn't." 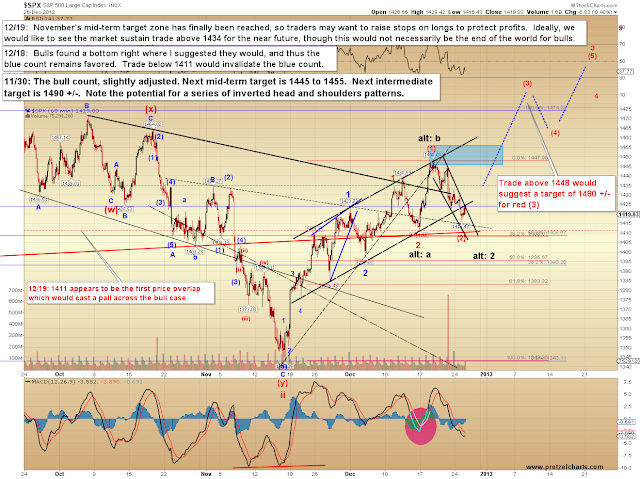 Next is the most straightforward of the bullish interpretations. 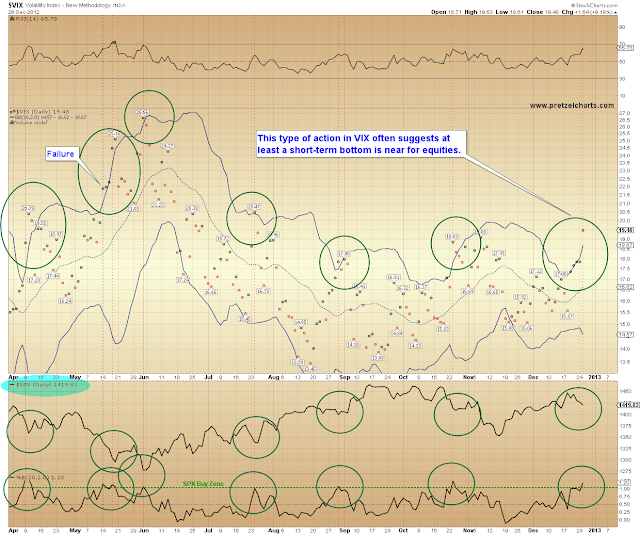 Since many fractals mimic others, I often look at related markets in order to try and gain insight and clarity. I pay close attention to the currencies -- though the reality is that currencies are not always correlated to the equities markets, they are usually helpful clues. It's generally a decent bet that a falling dollar equals inflation, which typically means higher prices in dollar-denominated assets, such as equities. 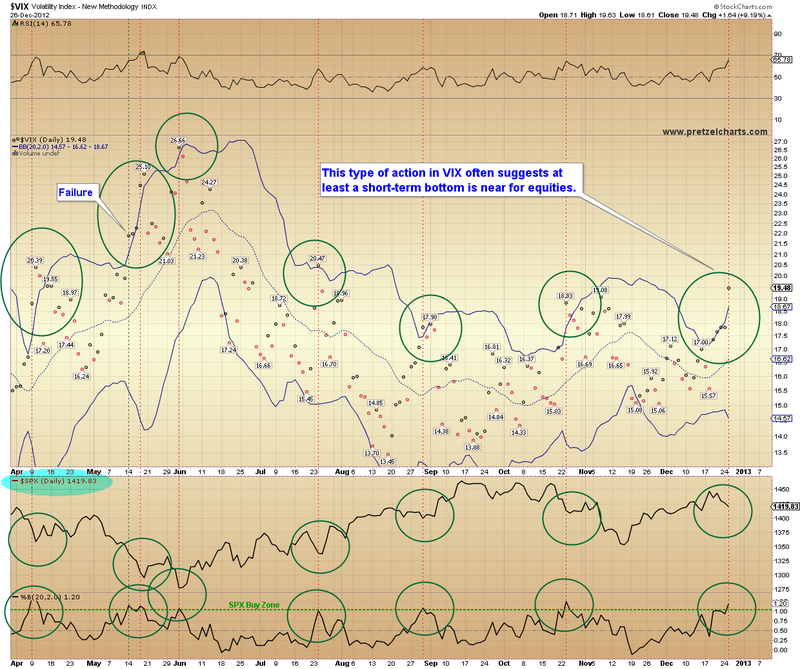 The Volatility Index (VIX) suggests at least a near-term bottom may be close for equities. 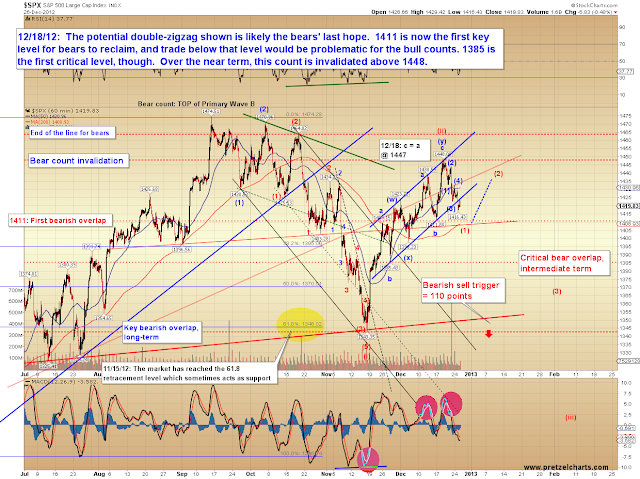 If the bull count still holds water over the intermediate term, bulls need to find a bottom quite soon. 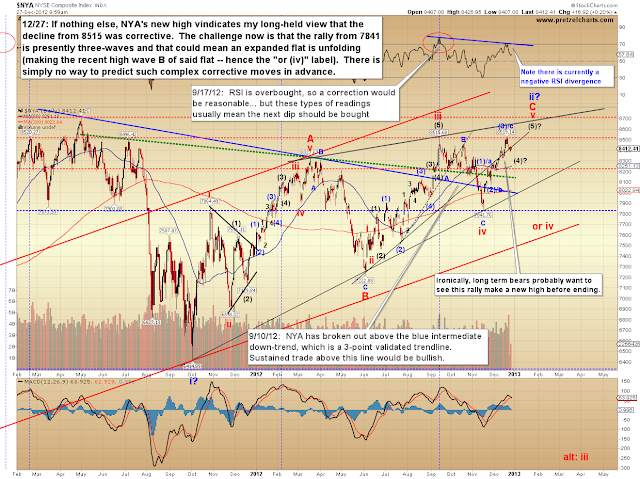 Next, I'd like to revisit the NYSE Composite (NYA), which has in fact made a new yearly high. I remained bullish about this index throughout the recent decline, so while it's always nice to have the opportunity for a little horn-tooting, that's not really my purpose in sharing this chart. 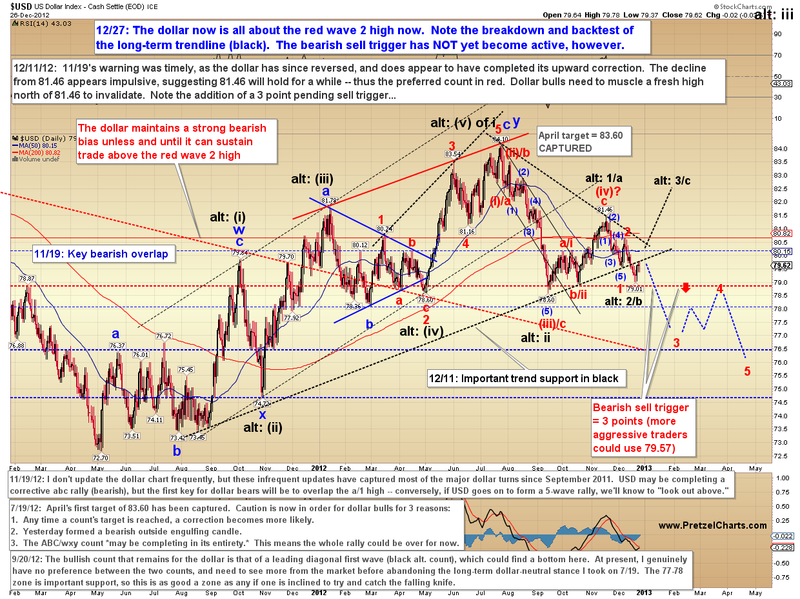 The point in this chart is that the rally since November is currently three-waves up, and it made a new yearly high. 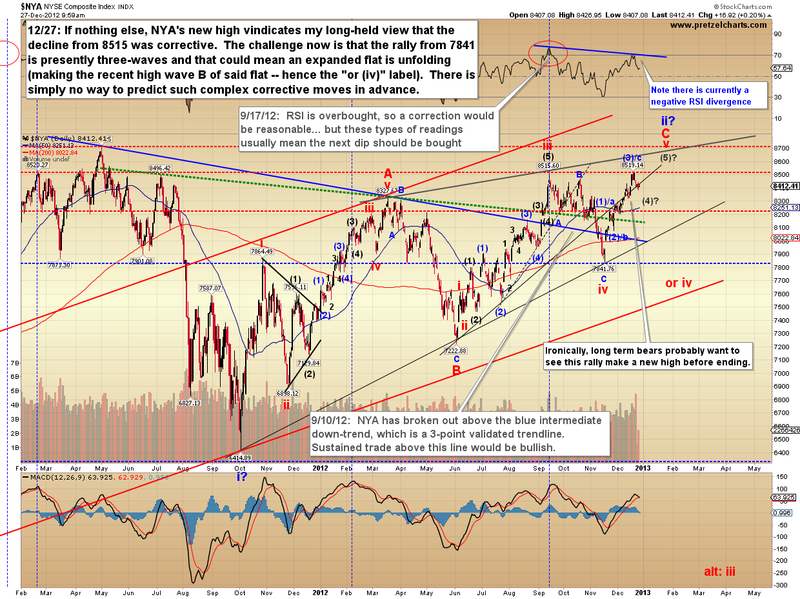 This is relevant because a three-wave rally in the direction of the prior trend, that also breaks the price extreme of the prior trend, almost always indicates that the trend will eventually continue -- even if a large correction ensues from that point. This means that, ironically, long-term bears probably do not want to see a continued and immediate move downwards in NYA. While that might be good for bears over the intermediate term, it would likely be long-term bullish -- so, ironically, bears would actually have more hopes for the long-term if a new high were made reasonably directly, in order to complete a five-wave rally. Normally we'd expect to see a new high rather directly with this fractal, but the Fiscal Cliff talks may be impacting the waves and could create a more complex correction than usual. 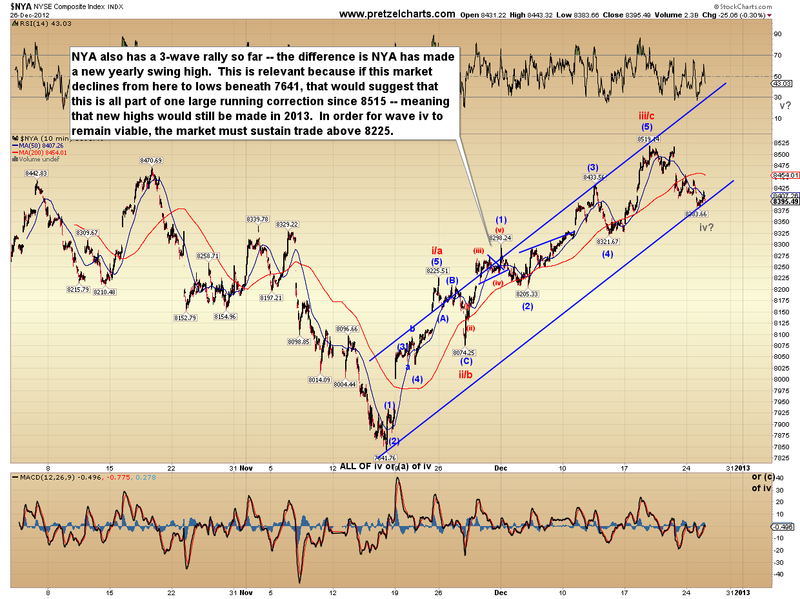 Below is the ten-minute NYA chart, which details the three-wave nature of the present move. In conclusion, the bears have pushed the market very close to a pivot point, and bulls now need to make a stand rather directly to keep their hopes alive. These are the types of trade entries that I consider to be low risk, since there is a nearby price point that conveys information if crossed, and that price point tells me (if nothing else) that "something else is going on" and it's time to exit. That said, I'm primarily a futures trader, and that means I'm not subject to the large overnight gaps which can occur in the cash market. Bears have a definite shot at taking control, and there are a number of signals right on the cusp of rolling into their favor -- and yet I have a gut feeling that bulls will somehow manage (yet another) stick save here. Ultimately, it's up to the market to dictate -- and it seems the outcome of the Fiscal Cliff talks will weigh into what happens next. So whichever side of the trade you decide to take here, stay nimble -- as this inflection point means both the bull and bear outcomes continue to remain viable. Trade safe. fear that they might jump. " I caught that line in the movie too and was just blown away by how powerful a statement that was. Cudos to the author of that script. Great quote Pretzel... incredibly appropriate.